BYPASSING SLIDING DOOR TRACK 4 FT.
Hanger and Track Sets For Both 3/4" and 1-3/8" Thick Doors Up To 50 Lbs. , with Adjustable Nylon Guide. Doors Not Included. Replacement Rollers Use 89-2950, 89-2951. Opening Size: 4'. 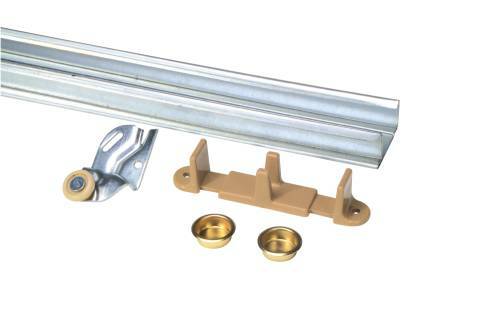 BYPASSING SLIDING DOOR TRACK 5 FT.
Hanger and Track Sets For Both 3/4" and 1-3/8" Thick Doors Up To 50 Lbs. , with Adjustable Nylon Guide. Doors Not Included. Replacement Rollers Use 89-2950, 89-2951. Opening Size: 5'. BYPASSING SLIDING DOOR TRACK 6 FT.
Hanger and Track Sets For Both 3/4" and 1-3/8" Thick Doors Up To 50 Lbs. , with Adjustable Nylon Guide. Doors Not Included. Replacement Rollers Use 89-2950, 89-2951. Opening Size: 6'. BYPASSING SLIDING DOOR TRACK 8 FT.
Hanger and Track Sets For Both 3/4" and 1-3/8" Thick Doors Up To 50 Lbs. , with Adjustable Nylon Guide. Doors Not Included. Replacement Rollers Use 89-2950, 89-2951. Opening Size: 8'.